Find which programs you are interested in and come join us! 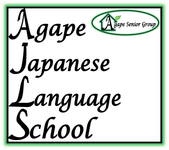 Please call at 253-212-3957 or email us at info@agapejapaneselanguageschool.org to reserve your spot!! PLEASE CONTACT US 24 HOURS PRIOR TO ORDER YOUR OBENTO LUNCH BOX!! For Obento Lunch Delivery; must be 12 orders or more. Delivery fee of 15% will apply.